Alabama 59 is the main thoroughfare from the coastal resort towns of Gulf Shores and Orange Beach to Interstate 10 at Loxley and Interstate 65 (via Alabama 287). The route doubles as Gulf Shores Parkway, a four-lane corridor stretching from Alabama 182 on the Gulf of Mexico to Interstate 65 at Exit 37. Widening of the highway was completed by 1996. The northern portion of SR 59 winds through pine forest and low rolling hills. South from I-10, the arterial travels through a mixture of agricultural areas, town centers, commercial development and increased suburban housing toward the coast. Overheads that were posted at the southbound split of U.S. 31 from Alabama 59 (Gulf Shores Parkway) near Stapleton. U.S. 31 turns westerly toward Spanish Fort while Alabama 59 continues south to Loxley. This sign bridge was removed by sometime after 2000. Vidcap taken 07/01/99. Southbound Alabama 59 at the northern terminus of Alabama 225. Alabama 225 is a north-south route along the western fringes of Baldwin County between Stockton and Spanish Fort. The highway is very rural in nature for the most part, with the exception of near Historic Blakeley State Park, where suburban sprawl is underway. Alabama 225 intersects Interstate 65 with an interchange three miles to the south. Photo taken 04/11/02. Southbound on Alabama 59 approaching Interstate 65. The forested scenery is common along Alabama 59 from the Monroe County line southward to Alabama 287. The pentagon in the background is for Baldwin County 21, a route that parallels I-65 west to Alabama 225 south of Stockton. Photo taken 03/23/02. Alabama 59 represents one of two routes between the Baldwin County seat of Bay Minette to Interstate 65 in conjunction with Alabama 287 (Jack Springs Road / Gulf Shores Parkway). The state route crosses into the city limits 3.7 miles south of a diamond interchange (Exit 34) with the freeway. Photo taken 06/14/04. Nearing Alabama 287 (Gulf Shores Parkway) on Alabama 59 (Hand Avenue) southbound. Alabama 287 begins at Interstate 65 (Exit 37) to the north and follows a four-lane divided highway to Alabama 59. Here Alabama 59 overtakes Gulf Shores Parkway / McMeans Avenue around Bay Minette to the northwest. Alabama 287 turns southward on Hand Avenue into Downtown. Photo taken 06/14/04. The changeover of Gulf Shores Parkway from Alabama 287 to Alabama 59. 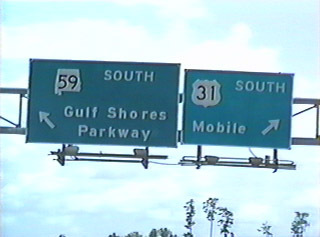 The four-lane parkway begins in Gulf Shores along the Gulf of Mexico and ends at Interstate 65 Exit 37. The roadway is the main access route for the resort areas of South Baldwin County from the north and also the main evacuation route for hurricane threats. Alabama 287 travels Hand Avenue two miles south to its end at U.S. 31 and the downtown square. Photo taken 06/14/04. Alabama 59 southbound reassurance shield and Foley Beach Express trailblazer, just south of the Interstate 10 interchange near Loxley. Alabama 59 is the divided four-lane Gulf Shores Parkway between Bay Minette and Loxley. The roadway loses its median from Loxley southward. This was not always the case, as the roadway was only expanded to four lanes by 1996. The increased capacity was a result of increased coastal development in the Gulf Shores to Fort Morgan area, and the demand placed on Alabama 59 during a hurricane evacuation situation. Photo taken 12/10/01. Alabama 59 (Milwaukee Street) south at the eastern end of Alabama 104 (Silverhill Avenue) in the city of Robertsdale. Photo taken 04/21/02. Advance sign bridge for the northern terminus of the Foley Beach Express. Foley Beach Express trailblazers can be found all along Alabama 59 and surrounding roadways. Photo taken 08/24/03. Second of two southbound sign bridges for the split of Alabama 59 with the Foley Beach Express. Although there are no interchanges on the bypass, the road has limited intersections, and an overall 55 mph speed limit. The only segment that is tolled is the bridge over the Intracoastal waterway. Otherwise, travel is free. Alabama 59 beelines southward towards downtown Foley and Gulf Shores. Although Foley offers a modern town feel, with many shops and other tourist friendly amenities, traffic tends to snarl, as lower speed limits and traffic lights impede through traffic progress. Photo taken 08/24/03. Shield assembly at the Foley Beach Express northern terminus. The highway opened to traffic in 2000. Photo taken 08/24/03. Southbound Alabama 59 (McKenzie Street) leaving the intersection with U.S. 98 (Laurel Avenue) in Downtown Foley. Photo taken 05/15/04. A set of mast arm supported signals operate at the intersection of Alabama 59 (McKenzie Street) and Myrtle Avenue. Photo taken 05/15/04. Baldwin County 26 (Michigan Avenue) skims the outskirts of Foley between Baldwin County 12 (Hickory Street) Alabama 59. Michigan Avenue continues eastward beyond McKenzie Street to South Maple Street. Pictured here is the signalized intersection of Alabama 59 south at Michigan Avenue. Photo taken 05/15/04. Alabama 59 (McKenzie Street) remains commercialized on the ten mile drive between Foley and Gulf Shores. Suburban type strip mall development lines both sides of the five-lane surface boulevard. Photo taken 05/15/04. Southbound SR 59 at CR 20 (Mifflin Road) on South McKenzie Street. Mifflin Road carries CR 20 east to the Foley Beach Express, Mifflin and Leiterman Road. Photos taken 05/15/04. Junction Baldwin County 4 pentagon for the Oyster Bay Road intersection of Alabama 59 (Gulf Shores Parkway) southbound in north Gulf Shores. Oyster Bay Road straddles the Intracoastal Waterway westward to Oyster Bay on Bon Secour Bay. Photo taken 05/15/04. Gulf Shores Parkway rises above the Intracoastal Waterway from Baldwin County 4 southward into Gulf Shores. The four-lane concrete bridge is rather non-descript asides the placement of ornamental light posts. Photo taken 05/15/04. Advancing south through Gulf Shores, Alabama 59 (Gulf Shores Parkway) meets the first of several traffic signals along the four to five lane boulevard. Canal Drive and 24th Avenue North intersect Gulf Shores Parkway just south of the Intracoastal Waterway bridge. Photo taken 05/15/04. Approaching Alabama 180 (Dixie Graves Parkway), one of two east-west highways serving the coastal areas of south Baldwin County. Dixie Graves Parkway travels 22 miles east from Fort Morgan and the Fort Morgan Peninsula to Gulf Shores and Alabama 59. The state route turns northward from Dixie Graves Parkway onto East Second Street, one quarter mile east of Gulf Shores Parkway. Photo taken 05/15/04. Alabama 59 south at Alabama 180 (Dixie Graves Parkway). Alabama 180 extends to the west end of the Fort Morgan Peninsula at the Fort Morgan State Historic Site and ferry launch for the Fort Morgan-Dauphin Island car ferry. Eastward Alabama 180 follows East Second Street northward to Canal Drive and the Intracoastal Waterway. From there Alabama 180 turns east en route to the Foley Beach Express and Alabama 161 (Orange Beach Boulevard) within the city of Orange Beach. Photo taken 05/15/04. Traveling the final mile of Alabama 59 (Gulf Shores Parkway) southbound between Alabama 180 and the southern terminus at Alabama 182 (Beach Boulevard). Alabama 59 straddles the western boundary of Gulf State Park between West Eighth and Sixth Avenues on this stretch. Photo taken 05/15/04. Public Beach access is provided at the southern terminus intersection of Alabama 59 at Alabama 182 (Beach Boulevard). Beach homes and condominiums line most of Beach Boulevard to the west and east of Alabama 59 otherwise. However Gulf State Park also provides several areas of public beach access between Gulf Shores and Orange Beach via Beach Boulevard eastbound. Photo taken 05/15/04. Southbound at Second Avenue two blocks north of Alabama 182 (Beach Boulevard). Second Avenue provides an alternate to Alabama 182 eastbound for Orange Beach by way of East First Street. Photo taken 05/15/04. Entering the final block of Alabama 59 (Gulf Shores Parkway) between First Avenue and Alabama 182 (Beach Boulevard). Alabama 182 straddles the Gulf of Mexico coastline between Pine Beach and Florabama at the Florida State line. The state route spurs six miles westward. Photo taken 05/15/04. End shield posted for Alabama 59 at the intersection with Alabama 182 (Beach Boulevard). Beach Boulevard consists of four overall lanes between a point two miles west of Alabama 59 and just east of the Intracoastal Waterway bridge onto Perdido Key. At the Florida State line, Alabama 182 transitions into Florida 292 en route to Warrington and West Pensacola, Florida. Photo taken 05/15/04. 06/14/04 by AARoads and Justin Cozart.